Small to large refrigerated vans | Which refrigerated vehicle is best for business? Which All Wheels Refrigerated Vehicle is Best for Your Business? 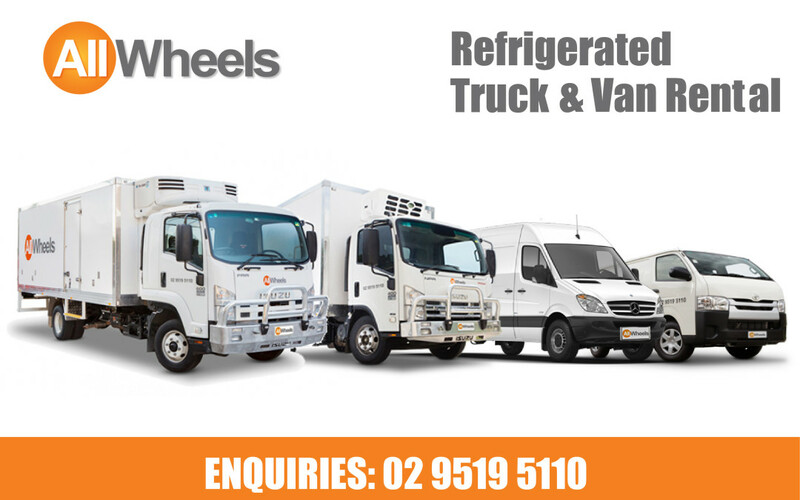 At All Wheels Refrigerated Rentals our fleet is continuously expanding to meet our clients’ diverse business needs. From florists, to food and beverage producers and distributors to food trucks, all of our clients need to keep their produce fresh and cool. However, there are other factors which mean their choice of vehicle varies widely, including geographical coverage, load type, size and industry. To help you decide which vehicle is best for your business, whether it’s to cover additional capacity requirements, vehicle breakdown or routine servicing, All Wheels have put together this handy guide to our Refrigerated Truck Rental Vehicles from small refrigerated vans to large refrigerated trucks. Small and nimble, with easy accessibility, our 1 tonne small refrigerated vans are perfect for lots of small drop-offs, especially in and around urban areas. It is quick to get in and out of anywhere making it efficient and quick. Great for multiple deliveries of flowers, food hampers or small packages of food or beverages. The super long wheel base option gives additional space meaning it can offer extra capacity if required to get more drops done without returning to base. When multi drops are pre-packed into pallets it is easier to load and get the drivers going. This vehicle can also be hand loaded to get maximum use of the truck and driver. Multi or quick pallet drops is what the 2 and 3 pallet refrigerated vehicles are perfect for. They are easy to maneuver and only require a car license. Our 2 and 3 Pallet Refrigerated Vehicles have the added benefit of being very easy to recruit drivers for as they only require a car license. It’s worth bearing in mind that the 6 Pallet Refrigerated Truck requires an MR drivers’ license. However, this does come with advantages for larger loads and wider geographic coverage. Our 6 Pallet Refrigerated Trucks can carry a bigger load than our smaller vehicles, perfect for when you have a significant number of drops either in pallets or as individual smaller drops. With its larger carrying capacity, the 6 Pallet Truck is often called upon to cover larger areas starting at locations further from base and then working its way back with multiple drops on route. Our 6 Pallet Trucks also have standby as standard meaning things stay cool even when the engine is switched off, perfect for overnight usage or drop-offs that take longer than usual. Again, with the benefits of standby, our 8 Pallet Refrigerated Trucks are our largest capacity vehicles. They suit larger geographical areas, but can also be used for city drop-offs providing docks and car parks do not have height restrictions of less than 3m. If you’d like to speak to an All Wheels Team Member about our Refrigerated Rental Vehicle Fleet to discuss which vehicle is best for you or to get a quote, please call us on 02 9519 5110 or complete our Enquiry Form. We look forward to hearing from you. OzHarvest CEO CookOff™ 2019 – That’s a wrap! *Please contact our office to confirm if you qualify for our free pick-up & delivery service, available for minimum 3 day rental, Monday to Friday from selected locations. Terms and Conditions apply.